Galapagos Conservation Trust (GCT) is the only UK registered charity to focus exclusively on the conservation and sustainability of the Galapagos Archipelago. Launched in 1995 at the Royal Society, GCT has supported a vast array of projects in Galapagos focussing on science and conservation, as well as sustainability and education. GCT’s mission is to support, develop and promote projects that achieve measurable conservation, sustainable living, and protection of the environment. 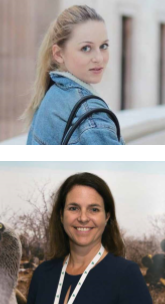 In this exclusive interview, we have had the pleasure of speaking with Jenny Vidler and Sharon Johnson of GCT, who tell us about their commitment to protecting the unique ecosystems of the Galapagos Islands. 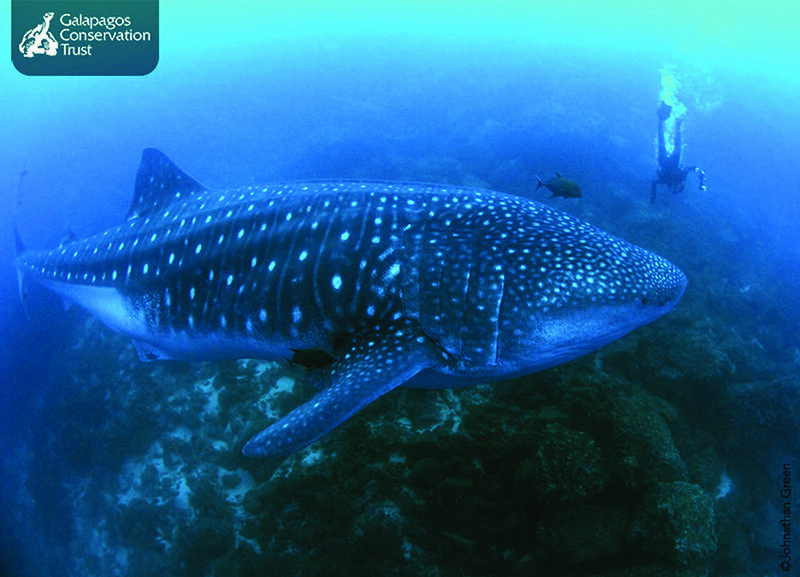 The Galapagos Islands are home to a huge diversity of wildlife species, many of which are found nowhere else on Earth. What are the biggest threats that these unique species currently face? The biggest threats facing the flora, fauna and marine life of Galapagos include invasive species, climate change and urban development. However, there are many other contributing factors that GCT is currently trying to fight. Man-made local issues such as human-wildlife conflict, and global issues such as marine pollution affect the health of the flora and fauna of Galapagos year-round. El Niño is also a pressing issue for vulnerable species across the archipelago, as the weather phenomenon is increasing in severity year on year due to climate change. Many species of wildlife fall in numbers, especially the Galapagos fur seal. The warming of the ocean reduces the food availability for the seals, causing starvation. During the 1982–1983 El Niño event almost all young fur seals were lost, with about 30% of adult females and non-territorial males, as well as almost 100% of the large territorial males. Galapagos giant tortoises, made famous by Charles Darwin, are the largest land reptiles on Earth, and may live for over 150 years. Please tell us about your work in conserving these majestic creatures. 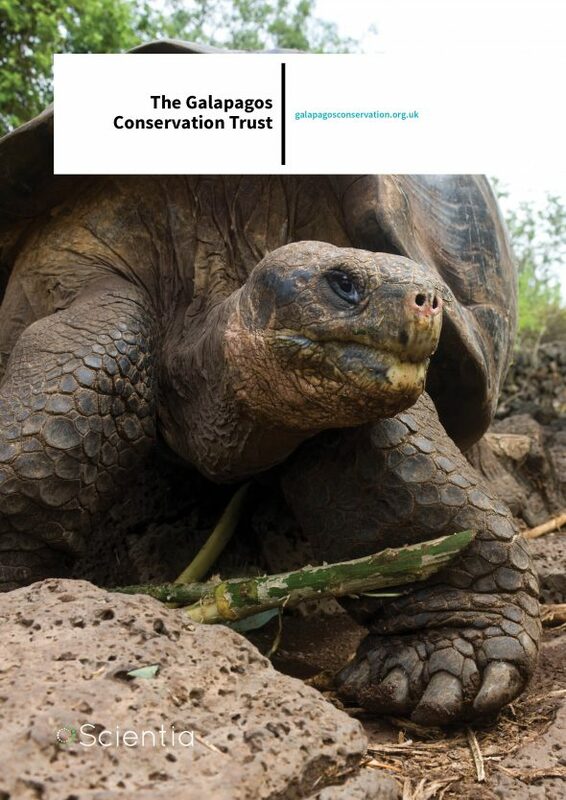 GCT is currently supporting the Galapagos Tortoise Movement Ecology Project (GTMEP). This project has a predominant focus on working with local people, especially farmers, to try to lessen the animalhuman conflict in the highlands of Santa Cruz. This conflict between the world’s largest reptile and local farmers is caused by the tortoises entering farms in the highlands of Santa Cruz and eating the farmers’ crops. This issue is a serious problem for farmers, as they often live day to day on their crops, so any plants ruined by the tortoises are costly to their livelihood. Through this project we hope to lessen the conflict by creating interest in the tortoises by providing a mediator between the tortoises and the farmers, as well as running after-school clubs for children to learn more about the importance of the biodiversity in the Islands, and the role the giant tortoises play. Activities include tracking the giant tortoises’ migration routes, monitoring nest sites and hatchling numbers and understanding why the fluctuations in the hatchling population occur. GCT’s GTMEP is the first project to ever study the giant tortoise hatchlings with such focus. This project is conducted with the hope of understanding why the severe fluctuations in population occur and to measure the severity of the outcome of the loss of the hatchlings. What seabirds native to the Galapagos Islands are most vulnerable to the effects of climate change, and why? What is the Galapagos Conservation Trust doing to prevent their decline? The seabirds of Galapagos most vulnerable to climate change are the waved albatross, the Galapagos penguin and the flightless cormorant. These three seabirds are particularly susceptible to the effects of climate change, as rising sea temperatures affect the birds’ food source. The small fish that make up many sea birds’ diets are affected by increases in sea temperature, leading to a decline in food. This affects their nesting habits and offspring, and ultimately the overall population. 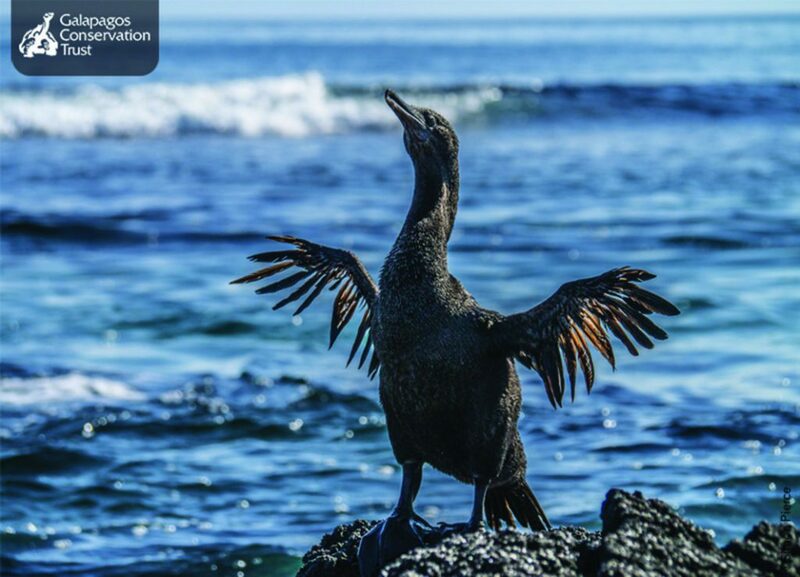 Another issue facing seabirds of Galapagos, and indeed all marine life is the global problem of marine plastics. Plastics dumped into the oceans and waterways of the world make their way into the sea currents, which means the Humboldt, Panama and South Equatorial currents draw ocean plastics towards Galapagos, which seabirds often mistake for fish. GCT is helping to combat the issue of declining seabird populations by funding research teams on Galapagos to undertake annual seabird surveys. These surveys aim to monitor the populations of each seabird species. This insight will help us to understand and address the increasing issue of climate change and marine pollution, and will be instrumental in the reports sent to the Galapagos National Park and the Ecuadorian government. This information will be put forward in a bid to increase the legislation towards the protection of the local and global environment. Although many Galapagos species are endangered, remarkably none have become extinct since before Darwin’s time. However, only about 100 individual mangrove finches exist on the islands today, meaning that they are at high-risk of extinction. Please tell us why the population has become so low, and describe the ways that you have been working to boost numbers. The two key factors causing the population decline of the mangrove finch Camarhynchus heliobates are parasitism of the chicks by the Philornis downsi fly, and the loss of their key mangrove habitat. The parasitic fly is an invasive species, introduced to the Islands by human settlement. The fly lays its eggs in the nests of the mangrove finch, and when the larvae hatch, the maggots feed on the blood of the newly hatching mangrove finch chicks. This fly is incredibly hard to eradicate due to a number of complex reasons. In order to combat the chicks falling fatal to the larvae, GCT supports a project which is aiming to lessen the impact this damaging parasite has on the mangrove finch. The Mangrove Finch Project head-starts the chicks, by collecting the newly laid eggs from the mangrove finch nests and transporting the eggs to a hatching facility on Santa Cruz, where the hatchlings are hand-reared until they are strong enough to be returned back to their native habitat where they will survive on their own, avoiding the risks from Philornis downsi. Another problem the finch faces is the loss of its natural habitat, the mangroves of Isabela. This is due to invasive plant species, though the removal of the mangroves by humans for the benefit of urban development is also a problem. GCT is working with the local population to help find sustainable solutions to the need for the expansion of the urban areas. 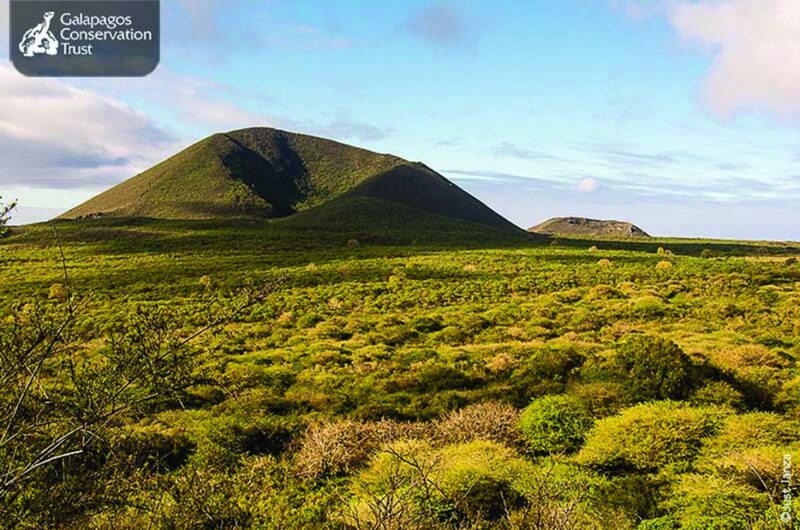 Increasing visitors and the growing human population pose some threats to the fragile ecosystem of the Galapagos Islands. Please explain some of the ways that you are engaging with local communities to ensure sustainability. One of the greatest threats to biodiversity is the introduction of invasive species. 80% of the loss of biodiversity worldwide has occurred on islands where people introduced invasive species like rats, cats and goats, that devastate unique flora and fauna. Humans have introduced species both inadvertedly as we have travelled, and on purpose, and have devastated the islands’ ecosystems. GCT is currently working in partnership with a number of other organisations on a project with the aim to restore Floreana island back to its former ecological glory. Floreana island is an island steeped in history, both ecological and human. The native Floreana mockingbird inspired Charles Darwin’s ‘theory of evolution’; however, due to decades of invasive species damaging the native flora and fauna across the island, the Floreana mockingbird now only resides on two tiny nearby Islets. The aim of GCT’s Floreana project is to create a sustainable future for both the native wildlife and the local community. This is the largest project of its kind ever to be undertaken, and we are hoping to improve the island’s biodiversity and ultimately bring the Floreana mockingbird back to its original home on Floreana island. This project is a new approach to community engagement and eco-tourism and we hope it will have a long lasting positive impact on the island. The iconic Opuntia cactus has also been strongly affected by the invasive species and this project hopes to reverse the damage done by restoring thousands of Opuntia across Floreana. We know island ecosystems do recover if invasive species are removed, but this has never been managed on large human inhabited island before. This project is a unique opportunity to demonstrate we can achieve this in Galapagos. Fifty-five endemic species are threatened with extinction on Floreana due to out of control rat and feral cat populations. Working with Island Conservation, we are supporting new approaches to community engagement, including a range of eco-tourism activities – which will mean Floreana is poised to become the world’s first large populated island to have its ecosystem restored, and the methods used will provide a template for archipelagos elsewhere around the world, benefitting hundreds of other threatened species. This project has already led to UN level recognition that Floreana can be the blueprint for the rest of the world’s islands. Fifty-five endemic species will benefit and thirteen locally extinct species will be reintroduced. Another element of sustainability GCT encourages is using less plastic across the archipelago. In the near future GCT will be launching a project to combat both marine and terrestrial plastic pollution with the aim to make Galapagos 100% sustainable and eco-friendly. Finally, please tell us about the Galapagos Conservation Trust’s focus on education, and its role in ensuring conservation efforts are maintained into the future. GCT has been working on the educational website discoveringgalapagos.org.uk, a bilingual, interactive website focussing on the wildlife across the archipelago. Lesson plans are available for teachers to use for free as well as interactive games, videos, worksheets and interesting images. We believe that today’s school students are tomorrow’s conservation ambassadors and the future stewards of our planet. By deepening their understanding of the natural world and the conservation challenges that we face in the future, we hope to inspire and engage students in the sustainable development of Galapagos and the wider world through the Discovering Galapagos programme. The isolation, iconic wildlife and unique geography of Galapagos have created a natural system with unrivalled subject matter for this kind of resource. The issues faced in the microcosm of Galapagos are of global relevance and the communication of these problems and their potential solutions have undoubted value for other areas of the world. GCT also supports awareness raising outreach activities across Galapagos with a range of partners in order to provide a lasting message of conservation and sustainability to the local population. We support field trips for local students and youth groups to visit science projects such as the giant tortoise hatchling study on Santa Cruz to benefit from the experience of witnessing conservation first-hand. We also support community-led events such as the annual Shark Day held on San Cristobal island that draws attention to the value of sharks within Galapagos waters; the day aims to draw attention to marine conservation issues more generally using sharks as flagship species. If you would like to learn more about Galapagos Conservation Trust visit galapagosconservationtrust.org.uk. Please donate to help GCT to continue ground-breaking science and conservation projects, and to preserve the unique flora and fauna of the world’s most famous Archipelago.